Frederich ‘Ninja’ Naumann, by his own admission ahead of his biggest test yet, surprised the crowd with ghost like contact lenses when he faced off with brutal former welterweight champion Dallas Jakobi, no doubt a tactic to get into the mind of the Durban legend. The much hyped bantamweight showdown between Donnovan Wilken and Matthew Buirski took a further controversial turn when Buirksi failed to make weight, coming in at 1.35kg over, forcing him to negotiate a purse penalty with Wilken’s camp. 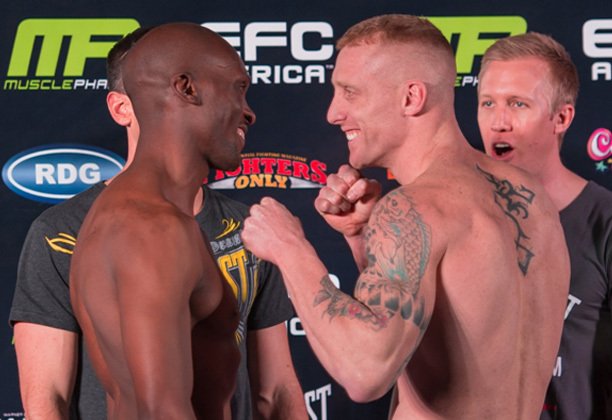 There was no love lost when the two men faced off, with EFC AFRICA president Cairo Howarth forced to break them apart. Further down the card, the heavyweight and light heavyweights delivered tense stare downs. Egytian powerhouse Mohamed Aly and UK based Fraser Opie showed ominous intent and Egyptian wrestler Koko Hammer showed no fear as he glared up at the towering Roelof Scheepers. Two athletes failed to make weight. Aside from Matthew Buirski, Donald Nzirawa hit the scales at 1.95kg over the lightweight limit, a weight he will attempt to drop in the standard two hours.